In some special situations, the hierarchical approach leads to hypotheses about processes that span several hierarchical levels. Such phenomena are often called 'scaling' phenomena because there are characteristic patterns observed across several scales of measurement. Fractal patterns are a special class of scaling patterns that have the attribute of self-similarity. Self-similarity means that the pattern at smaller levels is repeated exactly at larger levels. The self-similarity of a fractal pattern may not be evident upon initial inspection, but shows up when the pattern is measured using several different measurement scales (Figure 1). Although there are rarely explicit models of ecological processes that generate fractal structures, fractal patterns are often used as a 'null model' to describe spatial patterns that result from spatially explicit ecological processes. Generally, scaling occurs in an ecological system when there are similar constraints on processes occurring at different scales. 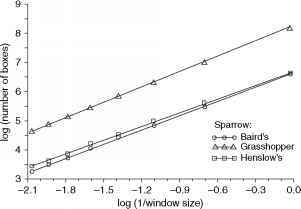 Figure 1 Scaling of the minimum number of squares of a given size (window size is the length of the side of the square) that are needed to cover the geographic ranges of three congeneric species of sparrows in North America. The slope of each regression line is a function of the fractal dimension of the geographic range of each species. From Maurer BA (1994) Geographical Population Analysis. Oxford: Blackwell Science. more inclusive entities can be resolved no faster than the kinetics of their lower-level elements allow. Population change can occur no faster than individual organisms are able to give birth, for example. Similarly, larger entities must take up more space than the components that comprise them. This usually creates a relationship between the spatial scale at which a system is identified as a distinct system and the temporal scale on which its kinetics is best measured. Different subfields of ecology measure ecological systems at different scales of space and time (Figure 2). 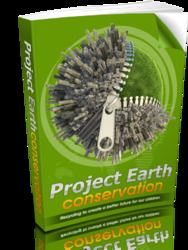 Thus, each field provides different information on the different scales at which ecological systems are thought to operate. Identification of scaling attributes also implies the existence of hierarchical organization in a system. The repetition of a pattern at different spatial and/or temporal scales suggests the operation of a set of self-similar set of processes. For example, measurement of the temporal dynamics of a biological community may provide evidence for a set of birth-death processes that operate at different spatial scales: organismal birth-death dynamics may be nested within a population that undergoes a colonization-extinction process. These processes may occur at different rates for different species in the community, leading to community replacement (e.g., succession) over time. Figure 2 Approximate spatiotemporal domains of several subfields of ecology. Note that there is a general positive relationship among the spatiotemporal domains across different subfields, with considerable overlaps of scales among subfields. observation gave rise to the idea that the same growth processes could lead to different results ifsmall alterations were made in the relative growth rates of different structures in different species. It was soon realized that these differences in relative growth rates in different species could explain adaptive differences among them. This gave rise to the concept of allometric (alio = different, metric = measures) scaling. The idea that the same growth processes scale differently in different species implies an underlying unity among a set of diverse phenomena. Further work showed that just as morphological traits scaled differently with body size among species, many physiological and ecological properties show similar scaling laws. Some processes, such as metabolism, obey the same scaling relationship to organism size across a vast range of body sizes (Figure 3). In addition to organismal attributes, population phenomena such as population density, population growth rate, and population energy use show scaling patterns with body size. 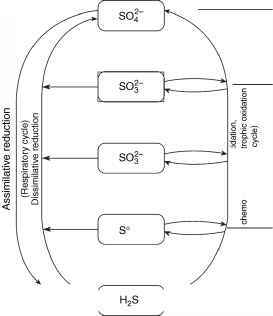 These scaling relationships imply an underlying unity in the processes that determine ecological patterns among organisms, communities, and ecosystems. in a specific deposit, there are more species of fossils identified in layers representing longer time spans. Spatial and temporal scaling laws are receiving more attention as studies aimed at understanding ecological phenomena become more sophisticated. Figure 3 Scaling of temperature-corrected biomass production (kgyr~1) with body mass across more than 20 orders of magnitude in body size. The same general relationship holds for different groups of plants, animals, and protists. From Morgan Ernest SK, Enquist BJ, Brown JH, etal. (2003)Thrmodynamic and metabolic effects on the scaling of production and population energy use. Ecology Letters 6: 990-995. Figure 4 (a) Scaling of mass-corrected metabolic rates of different groups of organisms with temperature across a variety of taxa Note that taxa have similar slopes but different intercepts. Intercepts are higher for homeothermic vertebrates than other taxa. (b) Confidence ellipses for the same taxa as in (a). Note that there is considerable overlap among the different taxa. There is a single scaling relationship between metabolism and temperature that varies only in specific parameter values among taxa. From Gilooly JF, Brown JH, West GB, Savage VM, and Charnov EL (2001) Effects of size and temperature on metabolic rate. Science 293: 2248-2251.
area of the network is maximized when it scales with volume to the power of 3/4. Since metabolic rate is proportional to the surface area of the network (i.e., the rate at which metabolic materials are delivered to their destination) and the mass of the organism is proportional to its volume (assuming constant mass density), metabolic rate processes (B) scale with biomass (I) as B=aMy4. This theoretical model provides a unifying conceptual basis for the widespread existence of quarter power scaling rules in many ecological phenomena. Phenomena ranging from individual metabolic rates to rates of energy flux in ecosystems can be described using this theory. The basic metabolic scaling result has been extended to include the effects of temperature and resource concentration on metabolic processes. Temperature effects are modeled using a Boltzmann function that assumes an 'activation energy' for the metabolic process. Resource concentration can be modeled as a Michaelis-Menten function that allows for a saturation effect on the resource distribution networks. Interestingly, the activation energy estimated from a wide variety of processes takes on a relatively limited range of values (Figure 4). MichaelisMenten functions have been used widely in studies of feeding behavior of organisms. Any process based on metabolic rate (energy production by organisms) could conceivably be represented by such a function. There are two major consequences of this type of relationship between resources and a metabolic rate process. First, it suggests that metabolic processes are most sensitive to environmental resources when they are in low concentration. Second, once resource concentration is high enough, further increase in resource levels have little further impact on the rate process.